If nominated, I will run. If elected, I will serve. 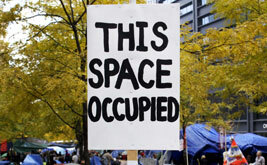 Occupy tiene que continuar su marcha como un movimiento decidido y frontal que ocupe bancos, casas matrices, juntas de directorio, campus universitarios y la mismísima Wall Street. The head of the beast can only be cut off at one place—and that’s downtown Manhattan. OK, God, we know James Dobson asked his followers to pray for rain on Obama in Denver last week. But this storm in New Orleans isn't what anybody had in mind. 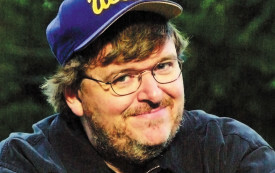 Filmmaker and author Michael Moore wrote the foreword to A Right to Be Hostile: The Boondocks Treasury by Aaron McGruder, from which the three cartoon strips are drawn. Copyright © 2003 by Aaron McGruder. Published by arrangement with Three Rivers Press, a division of Random House, Inc.